Eating lemons during these warm summer months is so refreshing. With the heat of summer and also since I’m experiencing the usual feelings of first trimester pregnancy, I have been craving the taste of lemons and want them literally in everything! So I have been using them in my cooking, baking and simply adding a slice to my water to sip on all day. The refreshing smell and taste of lemons has been known to calm the stomach and help combat morning sickness and nausea— even more reasons to eat my lemons! One lemon only contains about 17 calories, yet is high in so many vitamins and minerals such as calcium, niacin, folate, magnesium, B-6, riboflavin and vitamin C, to name a few. Eating lemons during pregnancy is a great way to make sure you are getting in these essential nutrients. With the health benefits and ability to minimize feelings of nausea, lemons have become a staple in my diet! The first thing I do when I wake up is drink 8 ounces of water with freshly squeezed lemon, then prepare my water bottle with a freshly squeezed lemon to sip on throughout the day. Not only is it refreshing, it also helps me drink my water throughout the day! During pregnancy, water is essential for the overall health of you and your baby. Water helps shuttle essential nutrients and vitamins into your cells and ultimately your baby. Water also helps excrete toxins and shuttle toxic waste. It can help keep things moving, which is important since it is common to experience constipation throughout pregnancy. Water also helps prevent itchy skin! It is very common as your skin stretches for you to feel like you just want to itch and scratch yourself all day. Water helps your skin stay moist and hydrated from the inside out, helping decrease this itchy sensation. Water also prevents water retention and “puffiness.” It is common to retain water when you are pregnant, but being sure to drink plenty of water can help keep water retention under control so you don’t feel as bloated and puffy! Whether you are pregnant or not, drinking plenty of water is essential for overall health and wellness, so be sure you are drinking plenty of water on a daily basis. A good rule of thumb is to drink half your weight in ounces. This is just a rule of thumb and, of course, if you are exercising or pregnant, you want to drink a bit more. I aim to get in three-fourths of a gallon to 1 gallon of water in a day. 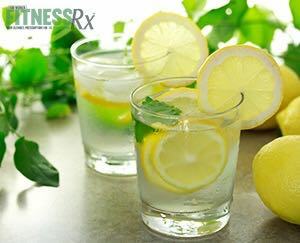 Adding lemons to your water is a great natural way to flavor your water, which helps you drink more. Gain all the health benefits of eating lemons while drinking your water all at once by adding a slice of lemon or two to your water! You can also add lemons to your cooking. I use lemons all the time to season lean proteins, top off a salad or add to my veggies. A little simple squeeze of a lemon adds so much flavor with very minimal calories! I have been baking my Lemon Burst Banana Poppyseed Muffins and having one each morning and throughout the day as a snack. They are satisfying my lemon craving yet sit light in my belly so I don’t feel overly full and bloated! They really are perfect for the summer months because of how light and refreshing they are. Give these a try and let me know what you think!! 1. Preheat the oven to 375 degrees. Grease muffin try to avoid sticking. 2. In one bowl, mix the dry ingredients. 3. In a second bowl, mix the wet ingredients. 4. Add the wet ingredients to the dry ingredients and combine until well mixed. 5. Fill the cups 2/3 of the way full. 6. Bake for about 25 minutes, until golden brown.